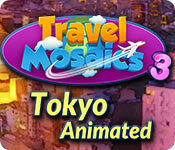 Travel Mosaics 3: Tokyo Animated is rated 4.6 out of 5 by 16. Rated 5 out of 5 by biscuitsmama from ANOTHER GREAT TRAVEL MOSAICS GAME I love mosaic type games and play at least a couple of boards a day. I was happy to see Travel Mosaics 3: Tokyo arrive on the scene as the Travel Mosaic games are some of the better games in this genre. 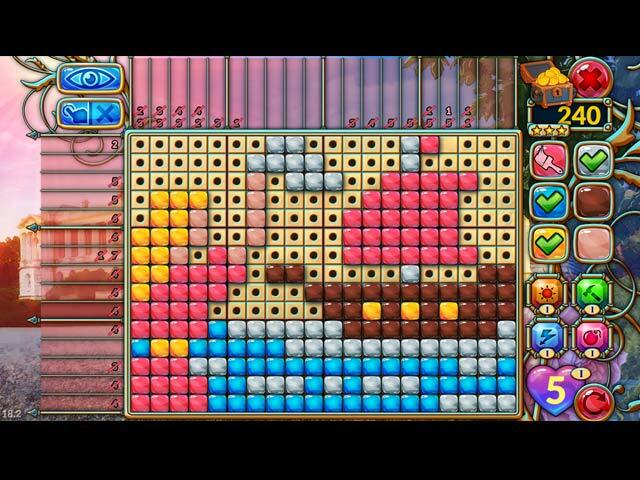 The Travel Mosaics offer features that I love such as the ability to select your tile set, and the difficulty level. I happen to play most games in a relaxed mode. The mechanics of the game are what we usually find in other Travel Mosaic games and I appreciate earning coins that can be used to upgrade some power-ups. I generally use the hammer and the sun power-ups most frequently when I am stuck and need a nudge in the right direction. 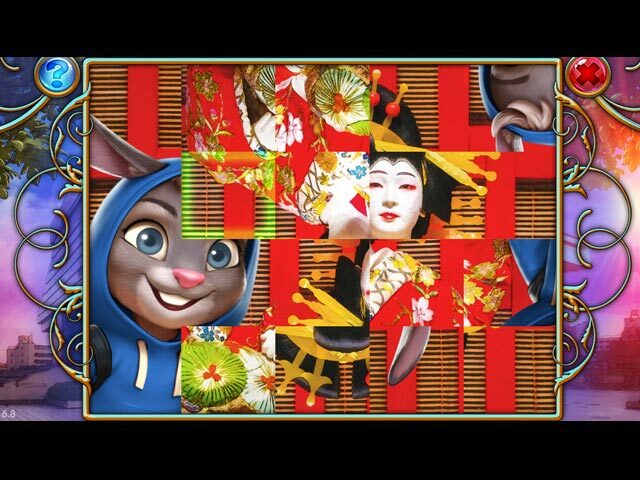 Travel Mosaics 3: Tokyo is definitely a game that I will add to my collection. With the different levels plus bonus levels it is sure to be a game that I will play often. Thanks to the dev for creating this wonderful series. Rated 5 out of 5 by LanaPook from I love Travel Mosaics 3 Tokyo I am so happy to see another in the Travel Mosaics series! Everything about the game is perfect. It seems to be a challenge for some to create a mosaic game that is fun, solvable by logic and can hold interest. Gladly This game fulfills on all of those levels. Hope to see many more in this series. Yay! Rated 5 out of 5 by zandu2 from exquisite This is one beautiful game as well as the game play itself. Well I'm stumped on what to say, just read all of the wonderful reviews of this game for they have said it all. Rated 5 out of 5 by KateyBog from New Game, New Journey This game is a perfect choice for everyone who loves nonograms and other puzzles, nice music, colorful pictures, travelling and just well-made games. I’m one of such persons, so I really enjoy every next part of “Travel Mosaics” series. This time we join the Walker family in their tour around Tokyo. I didn’t know a lot about this town but now I’ve seen how nice it is. Of course it’s not the most important thing about this game but still… What is the most important thing? The great gameplay! Every next level brings you a new challenge and a good opportunity to create bright, unusual picture using only numbers on the screen and your own brain. In this part of series it’s possible to choose easy, normal or hard difficulty mode so work hard or just relax and spend a nice time. The music is very beautiful, absolutely not annoying, and for me it’s even another reason to enjoy the puzzles. I recommend this game to all the puzzle fans! Rated 5 out of 5 by megatema from New trip with Travel Mosaics Love this game! Lots of fun. Everything works perfect as usual. Rated 5 out of 5 by dachsy from Superb Mosaic Game I agree with all the other reviewers that this is a mosaic game that is almost perfect and well worth playing. Great sharp graphics, appropriate music, plus all the other things we want in a mosaic game are here! As another reviewer said, there is only one small thing left for the devs to improve on now, and that is the bold black dots in the unused squares of the grid. They are rather imposing, and too prominent, making play a little more difficult than it should be. Perhaps a smaller, less-bold dot or something else would fill the bill. Otherwise, everything else is near perfect, making this a high rating game. Rated 5 out of 5 by MrsBen from DEEE-LIGHTFUL!! I Have all the "Travel Mosaics" games and they just keep getting better!! The music is VERY nice, the game tiles are very bright and colorful and you can gain knowledge about Tokyo as you go. When devs have a series of games that keep improving, you know they are on their toes. At least give this game a try! This time, they even have an "easy" game mode in which you don't choose one color at a time...when you decide to place 8 tiles, for instance, you actually have 2 or more colors in those 8 tiles. As you work horizontally and vertically, you are creating the picture, using only the numbers. Some of you may enjoy that factor. I tried it, but prefer to select each color and switch back and forth between them. I think it's a keeper...already bought it! 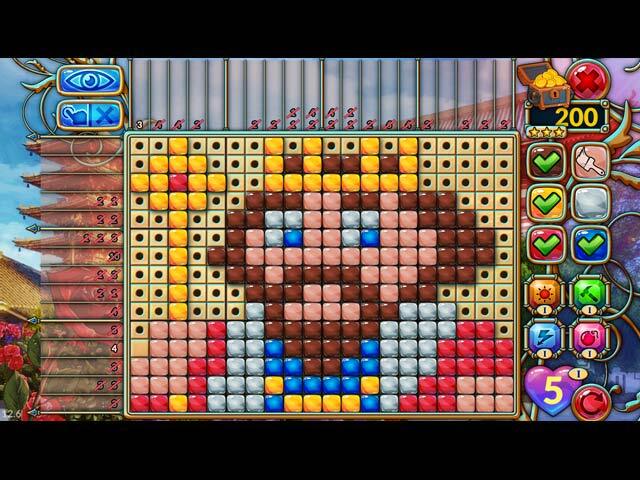 Rated 5 out of 5 by truckingirl from Travel Mosaics3 I love these types of games. I play and usually buy all that Big Fish puts out. the travel mosaic ones have become a favorite. Love getting the trophies and souvenirs I just wish you would make a separate category for the mosaics and griddlers.